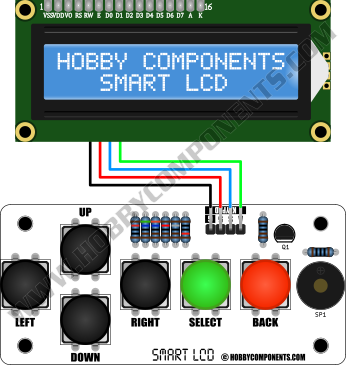 The 1602 SmartLCD module is a serially controlled 2 line by 16 character alphanumeric LCD display. Unlike most serial LCD modules on the market the 1602 SmartLCD includes a microcontroller which gives the module a rich set of features. It also requires no software or libraries to initialise the display, output text to the screen or control the features of the module, which reduces development time and frees up much needed resources in your microcontroller or development board. 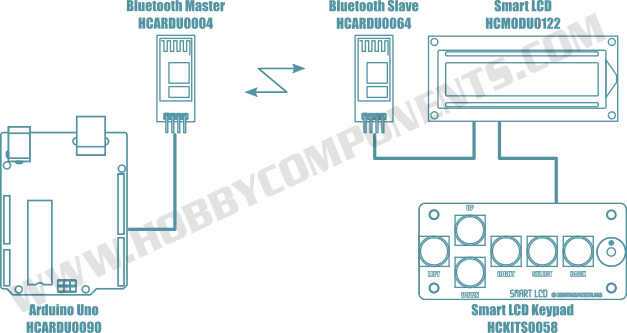 To interface to the module there is a choice of serial I2C, allowing more than one screen to be controlled from the same bus, or via a serial UART interface. When controlled via the serial UART there are two further operating modes (AT command mode and passive mode). When in AT command mode all the features of the module can be controlled from simple text based commands. These include controlling backlight and contrast levels and also printing text to the display. In passive mode any printable ASCII characters sent to the module via the UART are automatically printed to the screen. When in passive mode the module will also respond to a number of extended ASCII codes. 16 character by 2 line LCD display module. Very clear white text with blue backlight. No software or drivers required to setup or control the module. Software backlight control with 11 brightness levels. External keypad with buzzer support (optional extra, see item HCKITS0058). Control multiple displays from one I2C bus. Software control of all module features via simple I2C commands. I2C address configurable via software from 0x08 to 0x77 (default 0x27). Built-in 10K pull-up resistors for clock SCL and data SDA lines. Access to external keypad and buzzer. Software control of all module features via simple AT text commands. Software configurable baud with 8 different speeds (9600 BAUD default). Compatible with 5V serial UART devices (9600 baud default) – no microcontroller required. Automatically displays any printable ASCII text. Responds to a number of additional extended ASCII control codes. The SmartLCD's features can be further expanded with the addition of the Smart LCD keypad (see item SKU: HCKITS0058). This add-on board connects to the SmartLCD's keypad header using a single 4 way cable. Once connected it adds the additional features of keypad control (up, down, left, right, select, and back) and audible output to your end application. 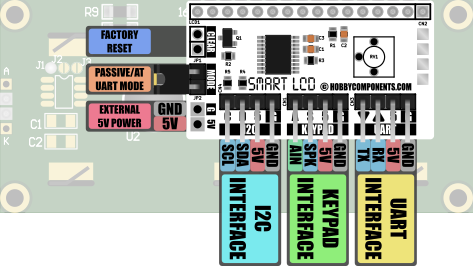 Access to button states and speaker output is then available via the SmartLCD's I2C or UART interfaces using its built-in commands (see the software section of the SmartLCD manual for more information). keypad with the addition of HC-05 Bluetooth slave (see item SKU: HCARDU0004) and Bluetooth master (see item SKU: HCARDU0064) modules. Hello, I bought your product on Amazon, I would like to know if my keyboard can handle multiple menus. 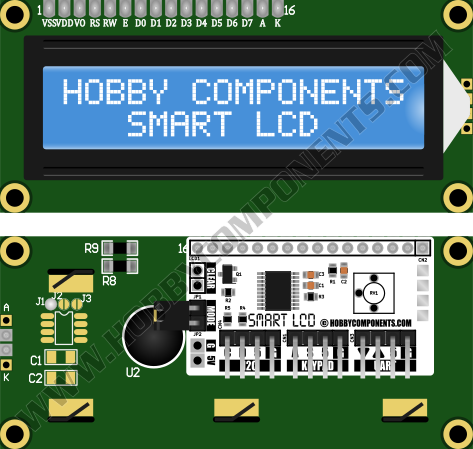 In fact, I'm designing an aquarium with an Arduino and Hobby Components 1602 SmartLCD (HCMODU0122) and I'd like to be able to fix times and more with the keyboard. Hello, I bought your product on Amazon, I would like to know if my keyboard can handle multiple menus. Yes it's possible but the SmartLCD itself doesn't have any built in menu system. Any menus have to be handled by your own sketch by sending text to the display and checking for keypad button presses. You may want to take a look at the example 'SmartLCD_Keypad_Example' sketch found in the SmartLCDI2C library which will give you some clues on how to send information and read back button presses. Last edited by andrew on Wed Oct 11, 2017 9:42 am, edited 1 time in total. Sorry if you are disturbed but are in trouble creating the code. I would like to change the time of the ds3231 via the button, do you think you can do it? I'm afraid we don't offer software design services but if you have any specific issues feel free to post them on this forum as somebody may be able to help. Thanks for writing the software I arrange it by myself, the important thing is that this hardware supports it. thank you very much and good job. Hi, I got the product but I can not find the scheme for welding the components, can you help me? I'm not that experienced programming in C and have struggled with using String arguments with the SmartLCD.print() command what was easy with lcd.print() seemed bizarrely difficult with SmartLCD.print().